As I may have mentioned - I have trouble actually committing to things (without freaking out) when it comes to planning for Baby G's arrival. When A wanted to go to Ikea a few weekends ago and pick up our new dressers a day earlier than I had planned, my hormones freaked on him. Then I was ok.
Those dressers still haven't been set up, thanks to our overabundance of furniture. But now, a very gracious MIL has agreed to temporarily store some of our stuff. Yay! That means I can keep planning without actually having to commit, because the furniture hasn't vacated our house just yet. Like I did today at work on my lunch break. Thanks to floorplanner.com I was able to custom design this little room for free. 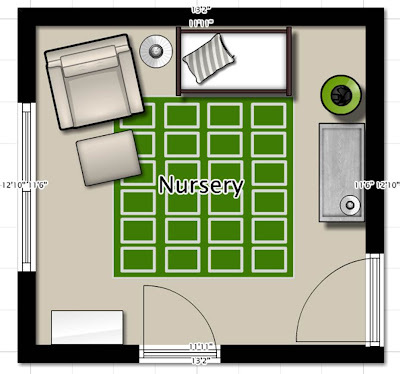 I have other designs with this website of our entire house layout (to scale, both floors). I am a crazy person, I know. But, I like knowing that everything will fit before I go buy it. Usually, I do these things in PowerPoint (this girl's best friend ever since I figured that I could update the old DJ Tanner routine when I was in middle school), but for today, I figured, why not do this baby in color? Besides, my PowerPoint version was saved on my home laptop. Why recreate the wheel? So there it is. Everything will fit nicely. Yay! Now it is time to commit to some purchases, though the rug (an impulse buy at Ikea) and the Hemnes dresser are already ours. This drawing includes our dresser which will double as a changing table, a cloth diaper pail, crib, floor lamp, PB glider and ottoman (though I am not entirely sold on the ottoman as necessary), and a little bookshelf for the corner. Am I missing anything? ...and I am ready to rock this nursery out - just don't make me lift anything myself. I you didn't mention crib. also check target this week, crib sale.